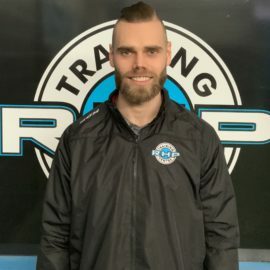 RHP Training Centre is pleased to announce the addition of Brett Robinson as Lead On Ice Instructor and Event Coordinator. Brett is extremely excited to be apart of the RHP Training Centre Staff. He will be making the move to Sudbury along with his family. His wife Ashley, their one-year old son Nixon and his dog Bella. They are all looking forward to being apart of the Sudbury community. Brett has an extensive & impressive hockey background. He played his minor hockey in Huntsville ON, made the move to AAA in Toronto and eventually on to Junior A hockey with the Milton Icehawks, where he accepted an NCAA Division 1 scholarship to Mercyhurst University. Brett is proud to say he graduated with a BA in Sport business and was able to play against some of the best college programs in North America. In his first professional season with the Cincinnati Cyclones his team won the ECHL Kelly Cup where he scored the game winning goal to clinch the championship. He went on to have a very successful ten-year professional career in both the ECHL and Europe with many personal accomplishments, such as MVP with the Idaho Steelheads and the Coventry Blaze (EIHL). While in Europe for three years he led the team in points for two seasons and in assists for all three. A couple highlights for Brett throughout his career would be attending the Philadelphia Flyers NHL training camp, participating in a European tournament with the AHL Hamilton Bulldogs, and being teammates with some of the best players in the world including John Tavares and P.K. Subban. Through out his playing career he has been lead hockey instructor at several hockey camps teaching and developing young players of all levels. Brett has been involved in the teaching aspect of the game his entire life and is very passionate about skill development and getting the most out of everyone he works with. Brett has a strong desire to teach and develop future players. His last season of professional hockey he gained valuable experience as a player/coach. He was involved with behind the scenes hockey operations, player recruitment and running practices. He is very proud to join this organization with such a great facility. He looks forward to helping each and everyone of you in reaching your maximum potential on and off the ice. 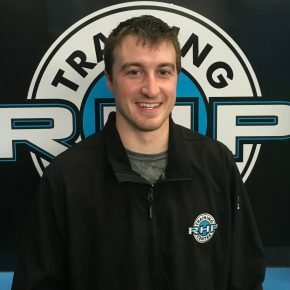 RHP Training Centre is pleased to welcome Guillaume Rheault to our dedicated team of professionals. 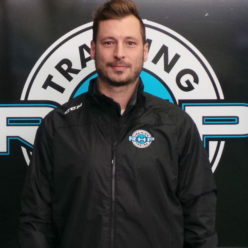 In his new role, Guillaume will be available to share his knowledge and passion as a member of our Strength and Conditioning Team, our On Ice Player Development Team, as well as working on Skating Development with our clients on the Blade Skating Treadmill. Upon University graduation, Guillaume worked as a Personal Trainer for a local gym corporation. Working with various types of clients and having dealt with many different injuries himself in the past, has motivated him to become a major advocate of proper movement execution. He has dedicated himself to continuously learn and study functional biomechanical human patterns in order for him, and his clients, to perform better, faster, pain free. Born and raised in Kapuskasing, Ontario, where Alain played his entire minor hockey. He went on to play Jr. A., NCAA, Major Jr., and got drafted by the Boston Bruins in 2007. Alain started his professional career for Providence Bruins in the AHL. He later played in the ECHL, VHL, and Ligue Magnus. Through his professional playing career, Al has gained valuable experience in different coaching approaches, systems, and techniques that he practiced, and now uses to train beginner to elite players. Whether you’re playing recreational hockey or have an aspiration of playing pro hockey, it’s always more enjoyable to excel in the sport. His secret to success is immersing yourself into your passion. It takes a great deal of dedication and hard work to master hockey and that’s why doing the extra training is important to get the results you want. A main goal as a coach is working on the players weaknesses with a purpose in mind, so it translates to the skill being performed instinctively in game situation. Professionalism, patience, and dedication are a few things that describe his work, and Alain feels blessed to give back to the game he is so passionate about. In addition to his role as Director of Player Development with RHP Training Centre, Alain serves as a Guest Instructor for numerous NOHA clinics and workshops, including the U15 Development Camp. Recently Coach Goulet also attended the 2017 Hockey Canada NCMP Seminar. Lisa is a NCCP Level 3 Figure Skating Instructor with additional qualifications in Canpowerskate, Canskate and Special Olympics. She has been coaching skating, powerskating and edge/turn development for over 25 years. Lisa was a competitive figure skater for 15 years. She is a graduate of the Physical Fitness Management Program at Cambrian College. Following her passion to teach children and touch the lives of others, she graduated with a Bachelor of Education from Nipissing University and is currently employed with the Rainbow District School Board. Lisa dedicates herself to giving her students and clients the tools they need in order to succeed. Her primary goal is to have a positive impact on their development both on and off the ice. 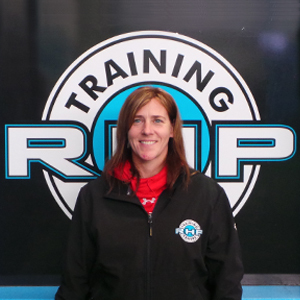 Lisa has been instrumental in the existing Complete Skating Program here at RHP Training Centre. 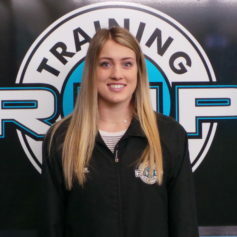 She has worked with a wide range of athletes with abilities ranging from OHL, QMJHL, NCAA, CIS, Junior all the way to Beginners. Regardless of the level, Lisa can help athletes take their skating to the next level. In addition to her role with RHP Training Centre, Lisa serves as a Guest Instructor for numerous NOHA clinics and workshops, including the U15 Development Camp as a Skating Development Instructor. Taylor was born and raised in Mount Forest, Ontario where she played boys hockey until Peewee. Taylor played AA Girls hockey for the Saugeen Maitland Lightning and the Kitchener AA Rangers. She then spent two years playing for the Kitchener Rangers of the PWHL before being recruited to the Laurentian Voyageurs, where she is currently Assistant Captain of her OUA team. Taylor is enrolled in the Concurrent Education Program at Laurentian University and is in her fourth year of studies in Sport and Physical Education. Taylor is passionate about the game of hockey. She is committed to training, both on and off the ice, for skill development and injury prevention. Taylor dedicates her time to each player to ensure personal growth and improved self-confidence.